Why should you consider a GPS device for you motorcycle? Easy - your next ride in the saddle could become an adventure with a motorcycle GPS device. 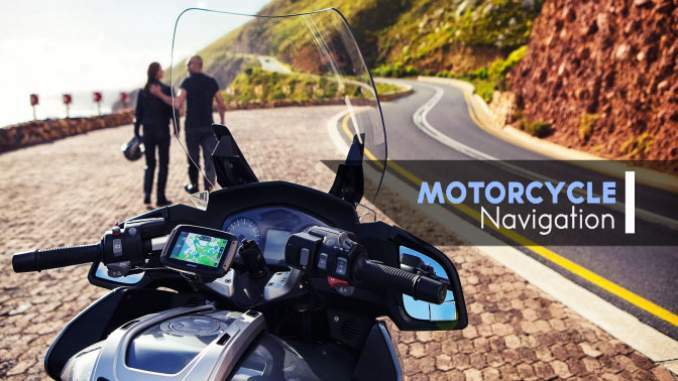 With a motorcycle GPS device you will no longer need to worry about getting lost. You will be able to discover new country sides, sceneries and destination all with the confidence of knowing exactly where you are at all times. You will have a new found freedom in exploring the open road. The GPS system can make your voyage as easy, relaxed and hassle-free as possible. If you feel like having a coffee, grabbing a meal, going to the washroom or filling up on gas, your GPS will show you the way. With voice guided instructions, and software packed with points of interest (POI) - like restaurants, service stations, and hotels - your GPS can promise you a drive of constant pleasure. Once you have decided to buy a GPS for your bike, what things should you look for when searching for the right GPS to buy? You will want to get the right balance between price and features. You will want a GPS device that is within your budget but which will also have the features that you will need. GPS devices purpose built for motorbikes have everything that a motorcyclist will need and are also vibration resistant, ensuring that the reverberation from your motorbike won't effect its internal workings. However, if you are looking for even more features than the purpose built motorbike GPS devices offer, then you will want to take a look at a hand held device which comes with many more applications. With a wide array of features and add-ons, for example: simple voice MP3 player, compass mode, guidance, and essentially portability, GPS devices like the TomTom Rider 550 and the Garmin Zumo 595 are perfect for motorcycles, plus a great variety of other outdoor activities. Or you use your smartphone. It's also effective and flexible. You don't need to spend money to buy a new device. Maybe without realizing it, the ability of a smartphone to know its position on this would earth is becoming increasingly important. In fact, now this ability has penetrated into very general use. In general, all smartphones must have this capability. Inside the smartphone is not GPS, but the signal receiver. The smartphone is the receiver, a.k.a the receiver or signal capture from GNSS satellites (Global Navigation Satellite System). The other term is 'navigation system'. In general, many are referred to as GPS receivers, because GPS is the most commonly known and first popularized navigation satellite series. On smartphones, we can find specific locations using the navigation application (which utilizes the GNSS signal). More precise terminology for "GPS applications" such as Google Maps and Waze are: navigation applications that utilize the GNSS system, which is generally GPS. With GPS systems becoming conventional, and new technology features and models incessantly striking the shelves, it can be quite a complex and difficult undertaking to decode the riddle of which GPS device will best suit your needs. But don't be discouraged. A GPS device will make your riding experience a whole lot more fun.